If you’ve been following along you know I’ve been demicrobing my garden through Solarization. Now it’s finally time to prepare the beds and plant them out. This is a system a lot of people are talking about and that has proved beneficial in urban spaces. 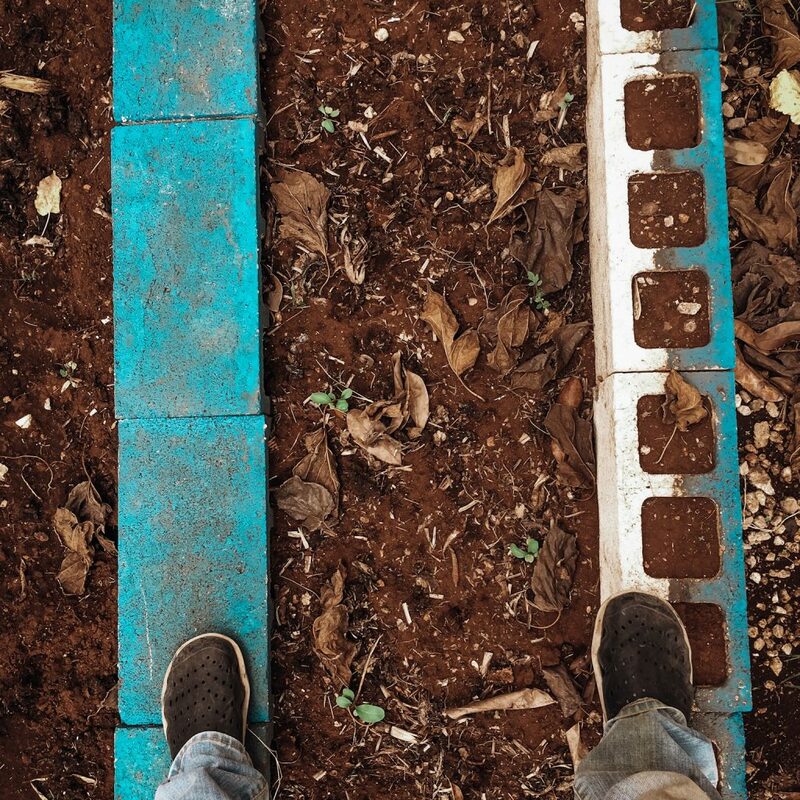 A lot of places don’t have the soil quality needed to grow food. A raised bed solves many space issues. 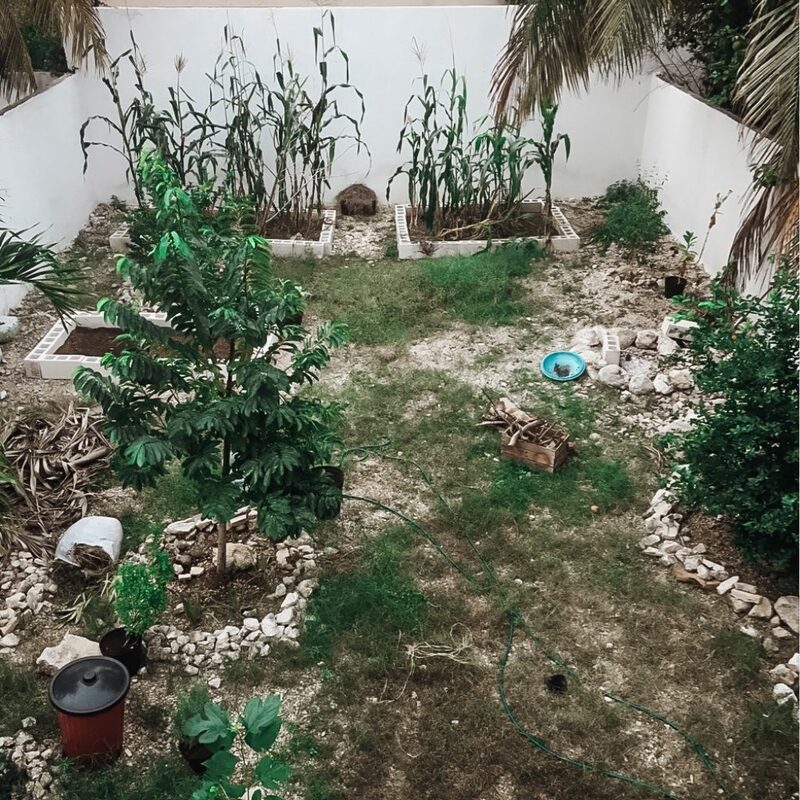 I take inspiration from the Maya community around me who stack rocks to make walls, houses and even their garden beds. 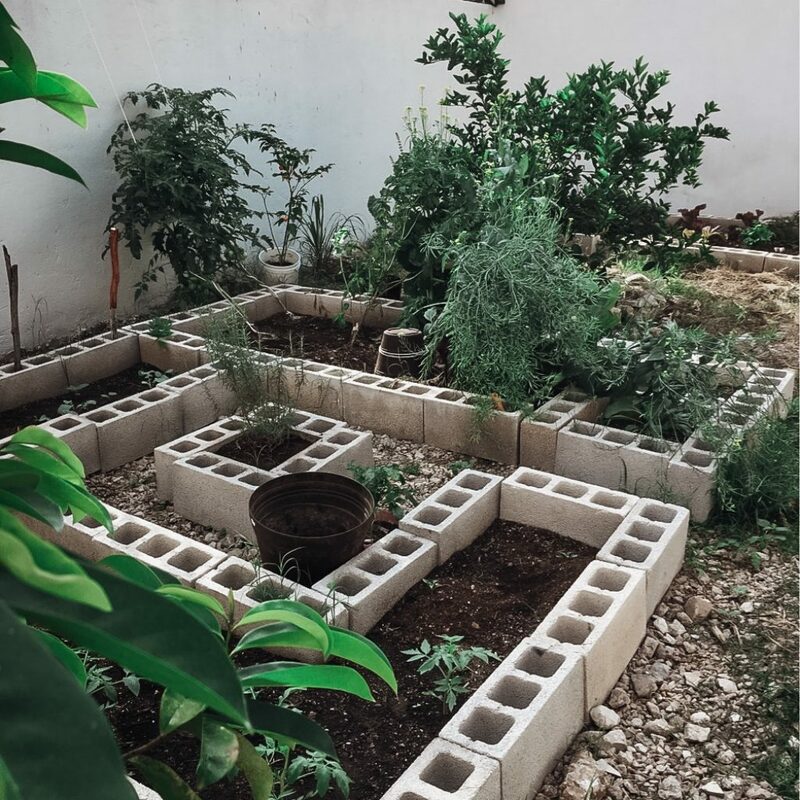 I didn’t have the time or energy to restack all my rocks into garden beds, so instead I worked over them by adding cinder blocks. 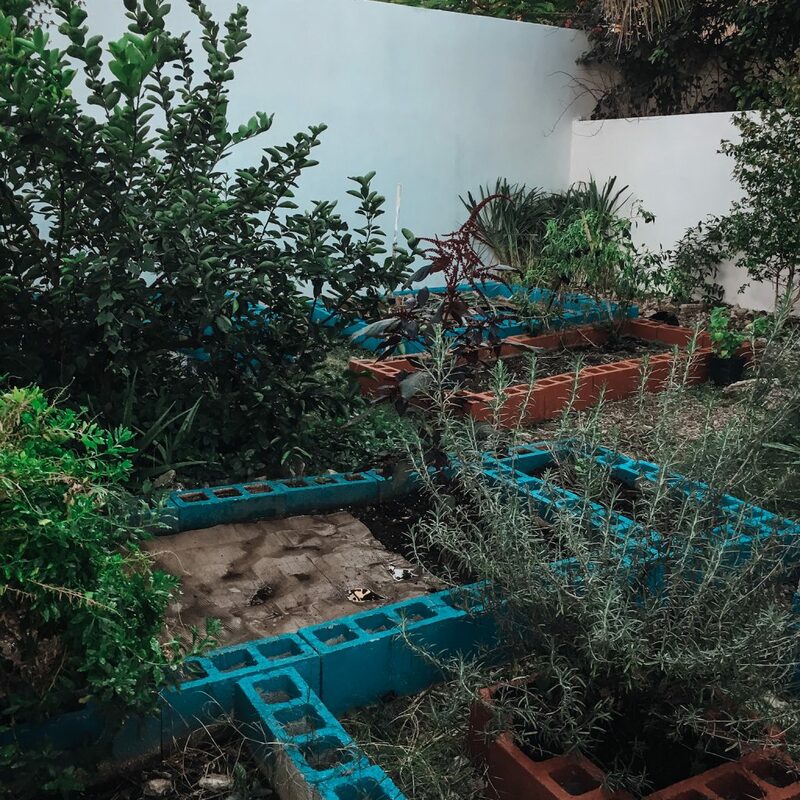 As If building the foundations of tiny houses I plotted out the various spaces of my garden and then one by one moved all the blocks myself. It was the work of many afternoons, a whole year of slowly building the next bed I was ready to plant. Yet, when I looked back over that year my garden was finally full. Some people plastic line under their beds to keep the weeds down, while this is a great idea I decided against it. 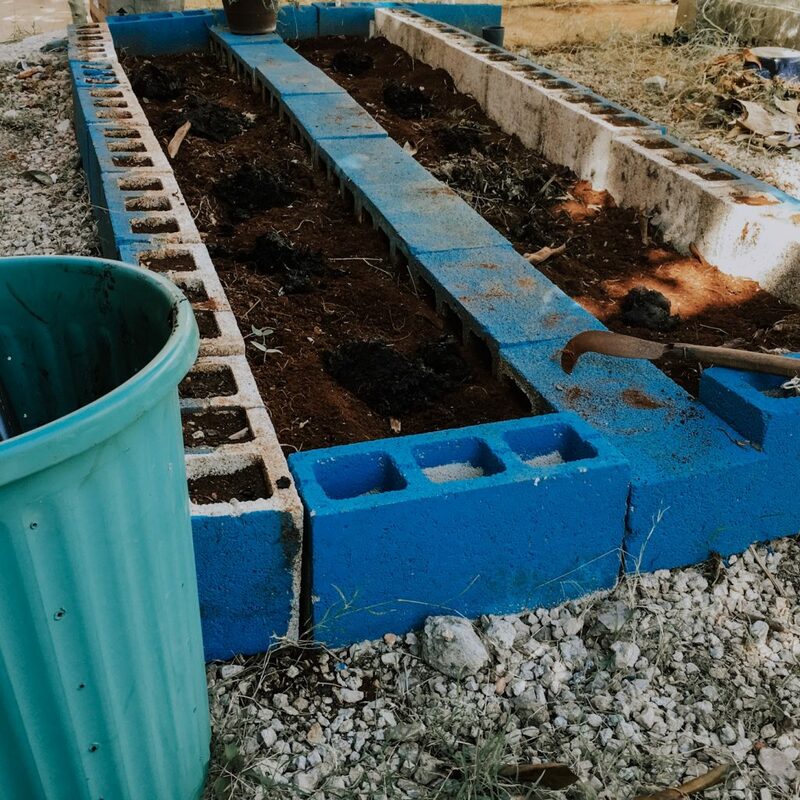 I only have one layer of cinder blocks so I leave the bottom open so the roots have more room to spread. I especially like the block system because it is ever movable. For the cost of an afternoon’s work I was able to move a whole bed to another part of my garden to make room for an unexpected tree. Another benefit of block is their durability, the last much longer than wood or plastic options. If you have a lot of space and won’t have to worry about moving your beds recycled aluminum is another great material to make beds out of. However, I have experienced that wood quickly rots in most areas. Use any material you have on hand to get about 12 inches of depth. However, if you are interested in a project building up a Hugelkultur is on my list of must try raised bed options. I honestly think they are one of the best raised bed systems out there. The mounds are filled with wood stumps, branches and other tree materials. You can grow in different layers over the mound and the rich soil will last a decade or two which is very needed in most urban areas. I honestly believe new building should use this because they remove so many existing trees and the Hugelkultur can be used in landscaping. This is one of the more critical steps and most gardeners joke that’s what they spend their winter doing. There is some wisdom in that though, I plan out my garden months in advance to know when to start seedlings. Some other 4 season gardeners just plant a cross section of seasonal seeds and space as they go. This works too as long as you know how much room each plant needs. 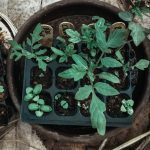 I have seen wonderful success with the square foot gardening methods, especially in foot deep or open bottom beds like mine. It’s much easier to remember to space everything 12 inches apart especially at the beginning. A lot of people like to mono crop and plant all lettuce together or all their beets in a row. This is especially good at saving space and increasing yield as you can usually plant a mono crop closer than a mixed bed. Check the spacing of each of your seeds and mark it on your packages if it isn’t already. This will help you remember the spacing. If you are seed saving, mark your new packages yearly or keep a book of records. I however do a form of layered permaculture based on the height of the plant. I place taller plants at the back of the beds and then something in the middle and finally a ground level. 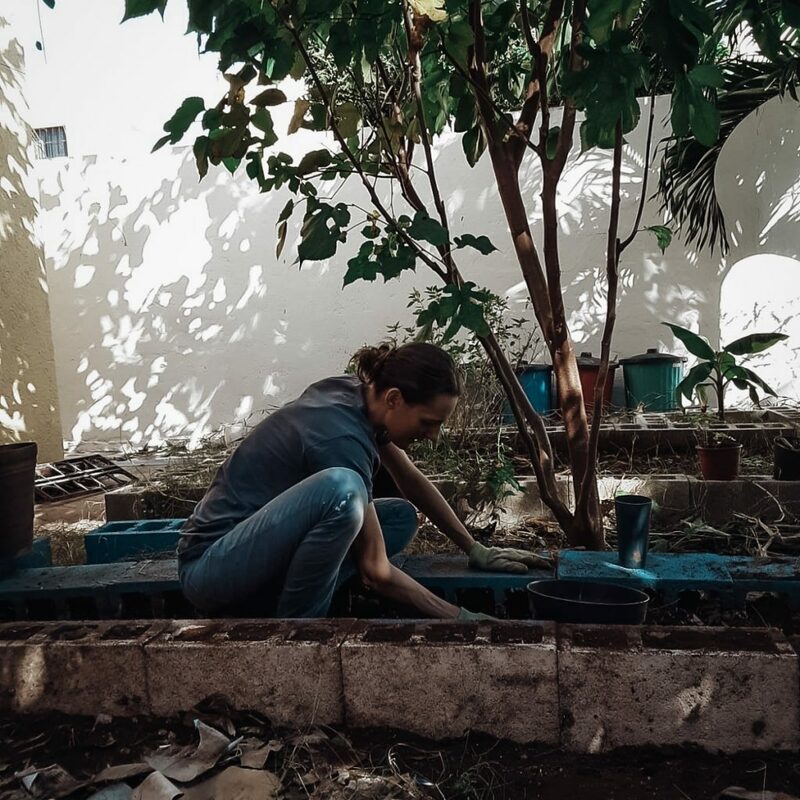 I enjoy permaculture planting because I can easily move my beds around the garden and rotate the soil use. 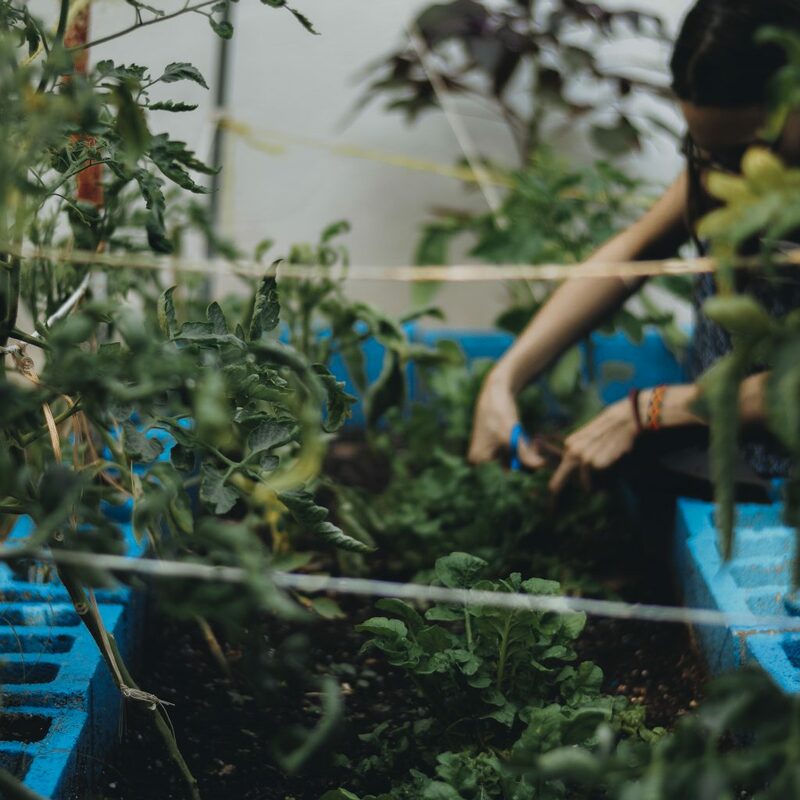 I also have a limited space and permaculture allows me to plant a little bit of everything to be eating each season. 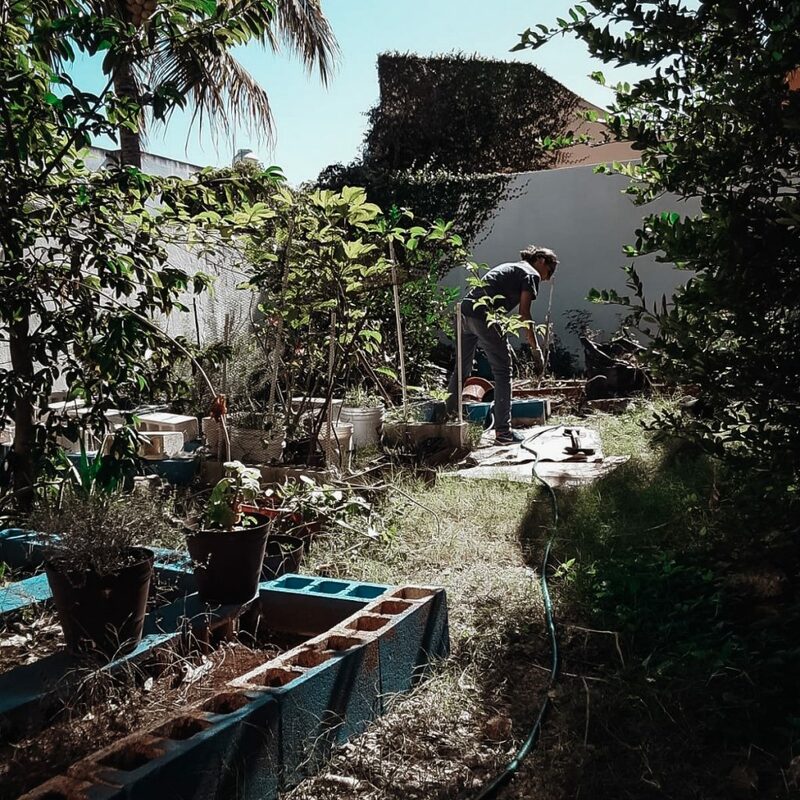 No method is the best method, every gardener has to learn what works for them in their space, time and resources. It takes a little trial and error, but there are some basic rules to go by and spacing is one of them. 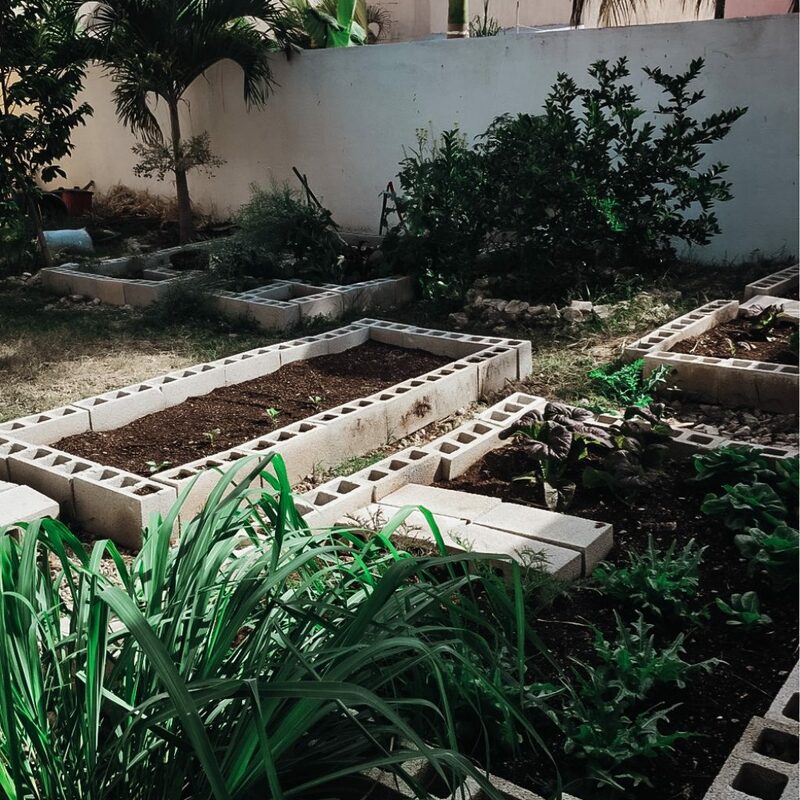 For spacing, I use a modified version of the square food method as all my beds are planned in 1 foot or 2 foot wide patterns. I plant almost all my rows in a zigzag or triangle pattern. The taller plants furthest from the rising sun, and shorter plants a bit forward about 6 inches in their own row, but between the 12 inch spaces of tall plants. Because I use a zigzag I plant about 6×12 inches apart instead of the classic 12×12 in a square foot design. I would only plant tall and medium plants 12×12 inches apart but small ground plants can squeeze into the middle space especially if they like partial shade. The best advice I ever got, only plant what you eat. If you don’t usually sit down and eat salad, having homegrown lettuce is going to do little to change that. The same goes for if you can’t stand beets or bussel sprouts skip them and plant double of something else. If you plant what you like the most it is more fun to work in the garden and watch the plants grow. These aren’t necessarily companion plants, just some permaculture I have found works well by size etc. Tomatoes I usually plant with arugula or kale around the base. If I have beets or onion seeds extra I may do a line of these instead or all the way to the front of my bed. Pepper plants I almost always add oregano or basil and other greens to the same beds as my peppers since I don’t have to worry about cross pollination. I plant the 3 sisters, corn beans and squash. If I am not planting corn I plant my beans with eggplants and my squash around trees or anywhere they fit. I let sesame seed plants and amaranth plants grow in the same bed to support each other since they are both tall stem plants. I plant carrots anyplace they will fit, usually in my cinder block borders. I don’t worry much about the garden “looking good” as much as the space having 3 layers. A tall plant, a middle sized plant and a ground level pant. Ground: carrots, chives, arugula, squash, beets, onions, other roots and tubers. I plan mostly a bed at a time to move my production through the space and to keep an even crop rotation. I never have an all tomato bed or an all beans bed, I always grow in permaculture. Because I can four-season garden I plant one bed with a complete variety of plants to harvest from one while the next bed (usually planted a month or two later) has an equal variety but a different peak harvest date. 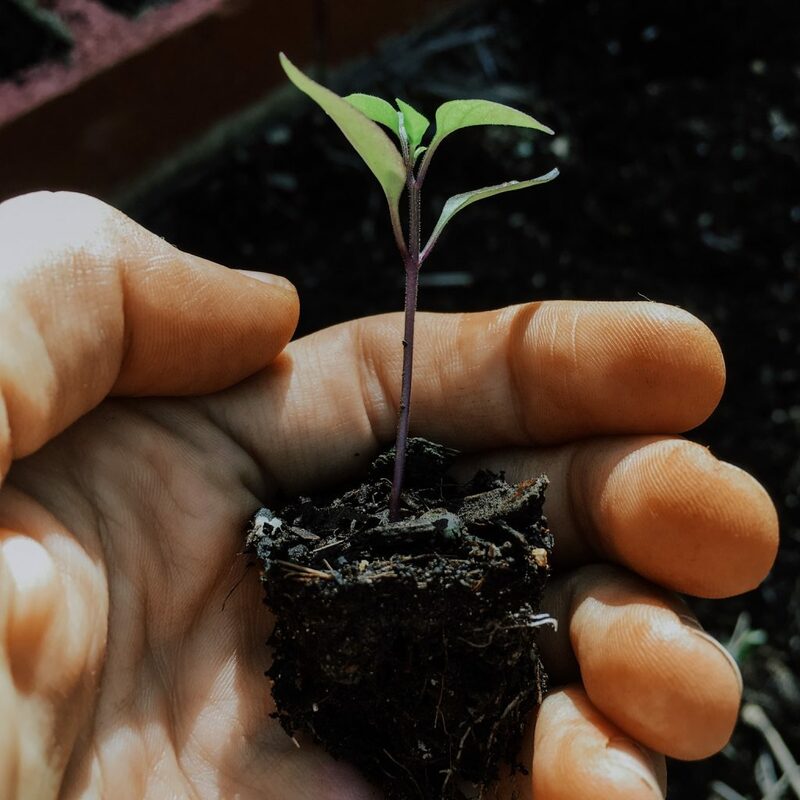 Every time I plant I add a little compost, every time I prune I add a little compost, every time my plants lose a lot of leaves I add a little compost. 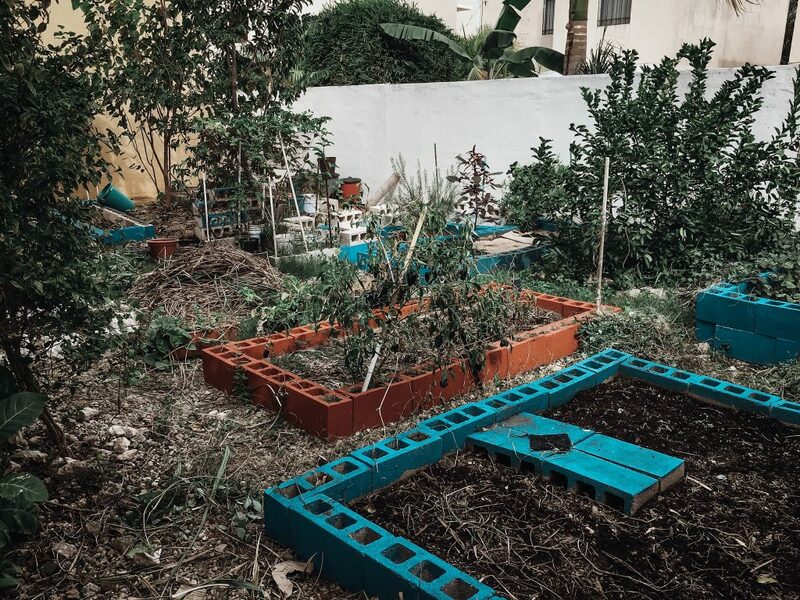 Compost is what makes your garden thrive. I add a pinch when seeding and a handful when planting. Anytime the plant looks droopy I add another handful or shovelful to the base. Compost can be purchased from your local nursery or made at home. 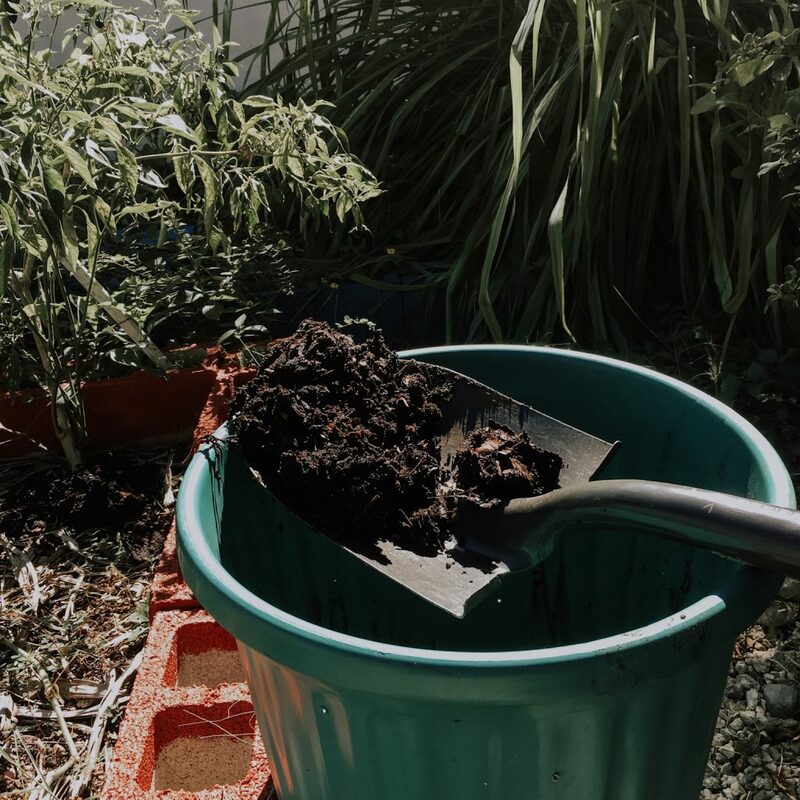 I firmly believe in making your own compost, firstly because you have natural food waste coming out of your kitchen and secondly to control the quality and ingredients in your compost. 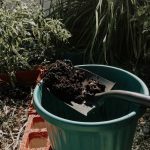 Read an in depth guide to compost here. but there are some things NOT to put in a compost pile.